That breeze wafting through your weekend may have been blessedly cool or tantalizingly hot, but, meteorological considerations aside, the winds of change are blowing. Keep your bins handy! Some changes are less than welcome. For example, not a single Caspian Tern showed up while I was hanging around the shore of Lake Ontario. So, I had to make do with much larger numbers than usual of Double-crested Cormorants moving westward. Corey’s Best Bird of the Weekend was a ratty male Tennessee Warbler that was aware of its tattered plumage and kept trying to preen it in presentableness. 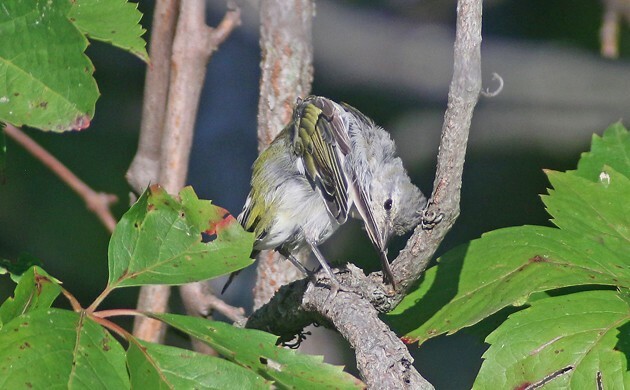 Despite the wood-warblers relatively unattractive plumage it was a pleasant sight at the Great Vly in Saugerties, New York. Horend Larks! I was hiking on the highest trail in the Olympic Mountains, Grand Ridge, and saw some of the resident Horned Larks flying about. I even got to photograph a female that was posing nearby. They have a huge range, but I’d only seen them once before. A freshly returned Pacific Golden Plover…nice and golden! Shorebirding was nice at a couple of different places in NJ, but like Wendy, my “best” of the weekend was a horned lark — a very fresh very snazzy juvenile, a plumage I don’t often get to see in the east. Black and white Hawk-Eagle in southeastern Costa Rica. This is one of the rarer raptors in Costa Rica. Warbler migration is in full effect at the Magic Hedge in Chicago. Like Corey, I got excellent looks at Warbling Vireos, and also spotted an Ovenbird and a Magnolia, but I always have to give a shout-out to the Black-and-White Warbler, for my money the most fashionable warbler of them all!